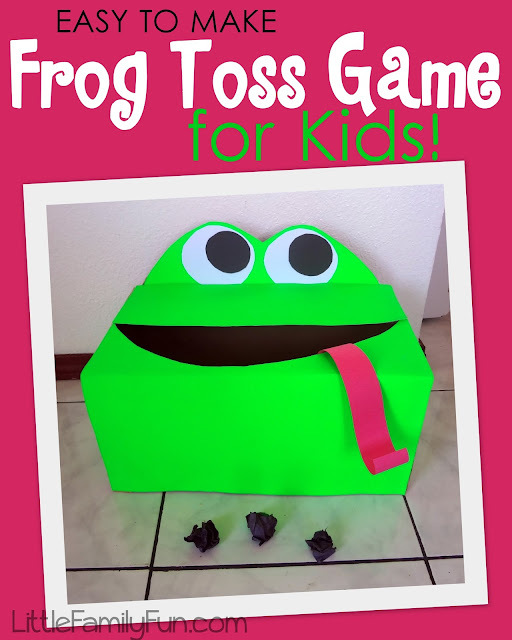 Little Family Fun: Frog Toss Game for kids! Frog Toss Game for kids! A few weeks ago our church had a little carnival for the kids. Each family was in charge of coming up with a little game for the kids to play, so I thought up this super easy Frog-Toss! You could make this as a learning game too! 2. With the piece you just cut out, flip it over and trim the round part to make to bumps. These will be the frog's eyes! 5. Cut out 2 big white circles, and 2 smaller black circles. Tape together. These are the eyes. Then Use the "mouth" shaped cut-out to cover the eye-shaped carboard. Then tape on the eyes. 7. I originally was going to use wadded up black paper as "flies" to toss into the frog's mouth. I had bought a bag of candy to give as prizes, and so I decided to instead have the kids toss the CANDY into the frog's mouth! Each child got 1 piece of candy. They tried to toss the candy into the frog's mouth. As soon as they made it in, they got to keep the candy! Great thank you!!! I'll used this this Thursday! ! Great idea! I needed something to help my little ones with the alphabet so I taped letters to the "flies" and when I called out a letter they each had to find the fly with that letter and toss it in the frog's mouth. If I called out "A" they would both run and find an "A" and then toss it in:) They had a blast. Kids loved this, and it looks awesome! Great fun! Made it with a big green blanket from goodwill, and stuck the eyes into slits on the top using the ends of the smile. Used plastic easter eggs wrapped in black fabric and tied with a rubber band. Great directions, and what an awesome idea, it was the hit of the party.